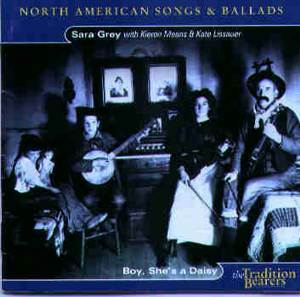 Sara Grey is a New Englander, brought up in New Hampshire. She has lived in six other states (East to West). In addition she has spent more than half her life in Britain, mainly Scotland, where she now lives on the Isle of Skye. This range of locale, coupled to thirty-three years of world wide touring, as a performer, has served to give her insights and perspectives denied to many. She is a, deservedly, respected traditional singer, collector, banjo-player and story teller firmly anchored in the rich and highly diverse American song and ballad tradition. She is joined on this album by her American-born, British-reared, son, Kieron Means, an acclaimed singer clearly influenced by his mother's repertoire. He, incidentally, has a forthcoming solo album in this same series. Sara is a skilled interpreter, a distinctive voice, a singer of stature, who conveys an intimacy, a sense of hearing the private voice in public … She has, over the years, worked hard to demonstrate via countless workshops and innumerable conversations, the links textual and musical between North America and Britain. This has helped deepen our understanding and appreciation of the idiom in general and of the many specific lyric and narrative songs that we share. Partly from the singing of Ginny Hawker, who learned it from Maggie Parker Hammons of Western Virginia. In this version the heroine never actually reveals her true identity but her lover just knows it. Other versions such as the one from Mrs Mary Sauels of Allanhand, North Carolina and the version from Roy Palmer’s collection "Oxford Book Of Sea Songs" are far more complete and clear, particularly about the cannibalism of castaway mariners, which was not only a recurrent theme in ballads but a documented practice in real life. Its interesting how events and relationships etc. consciously and unconsciously have a strong effect on what we choose to sing. After the terrorist attack on the World Trade Center in new York City on September 11th 2001, I found myself reflecting and singing songs about the grief of war. It prompted me to put them together for this CD.